It’s competition time on Goonerholic again and we are delighted to offer Twitter ‘holics the opportunity to win this wonderful North Bank print from Matthew J I Wood Design & Illustration. 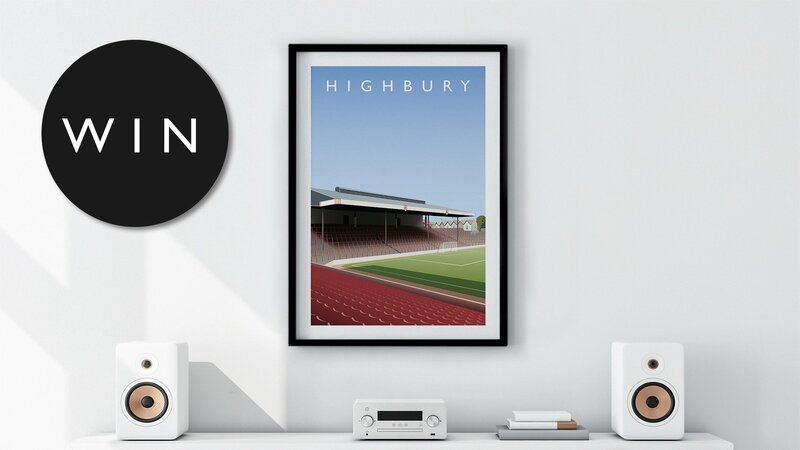 It is one of a range of atmospheric Highbury prints on sale at matthewjiwood.com and this one is just what I need for the North end of the box room/studio/editing suite! Thanks to Matthew for letting one lucky Gooner win a copy. In order to be in the hat just retweet the pinned tweet at the top of my profile page on Twitter, then follow @matthewjiwood and @TheGoonerholic. We will pick the lucky winner after the competition closes at midday GMT on Saturday. even this is not enough of an attraction to use twitter. /luddite. Utd losing tamely at home is bad news as they will now concentrate solely on their league performances. Just catching up on the last drinks. Given the current antipathy towards Kroenke and Gazidis, I wonder whether anyone now wishes that we had an oligarch at the helm? Things would probably have played out differently, maybe for the better? On a different note, is it just me or does the North Bank look ridiculously small in the photo? I’m sure it was bigger than that. OM@5- Amen to that. PSG made Utd look very ordinary and they had no penetration and never looked like scoring. PSG were a class above Utd. Their Champions League run is over. In continuation to my previous post, no one in the house here ever said anything about my comments, i meant it in general when I said is it wrong to say something is wrong and that makes me any less in any way, due apologies if anyone felt it was intended at someone here. United losing was fairly easy to predict, they just are not good enough, they will lose a few more till the end of the season, ole is no Fergie, not even a hope and United have a bunch of duds who just played well for a few games, talking of which wonder what has happened to Alexis, he can’t be this bad, can he!! Man City look the likeliest among the English teams to go all the way, honestly, they play really good football and only a team that can out pass them our defend solidly can beat them over 2 legs, in a one-off anyone can. RIP Banksy- a great goalkeeper and decent man by all accounts. That group of 66 are slowly fading away. I got a really annoying note on the train home after MU beat us in the Cup from a Manc friend who said how they had outplayed us and were on the rise. I was very tetchy and said PSG would outclass them at Old Toilet and Citeh and Liverpool were in a different class. Even with their best two goal scorers our PSG murdered them . Solskjaer has had an incredible run of luck with fixtures. Against us they made light of the fact that we lost two Centre backs in one game . I hope they go into freefall. Odious club.